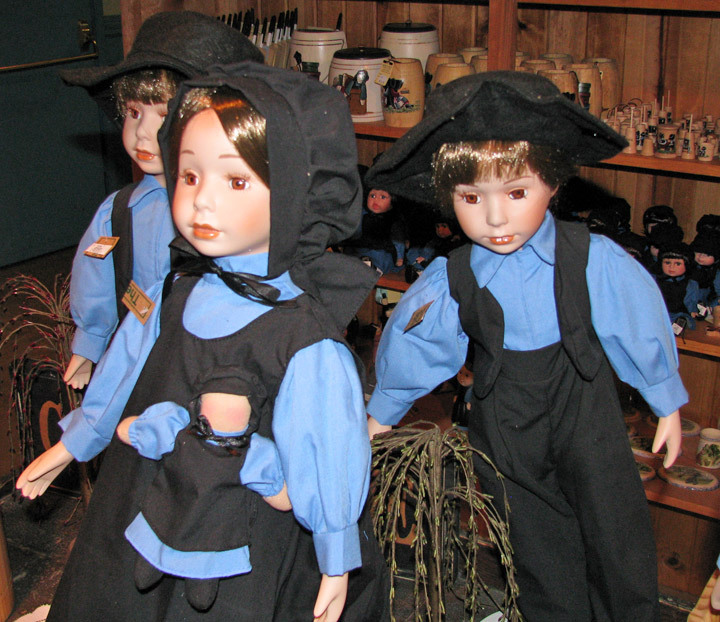 Amish Acres is a tourist attraction in Nappanee, Indiana created from an 80 acres Old Order Amish farm. 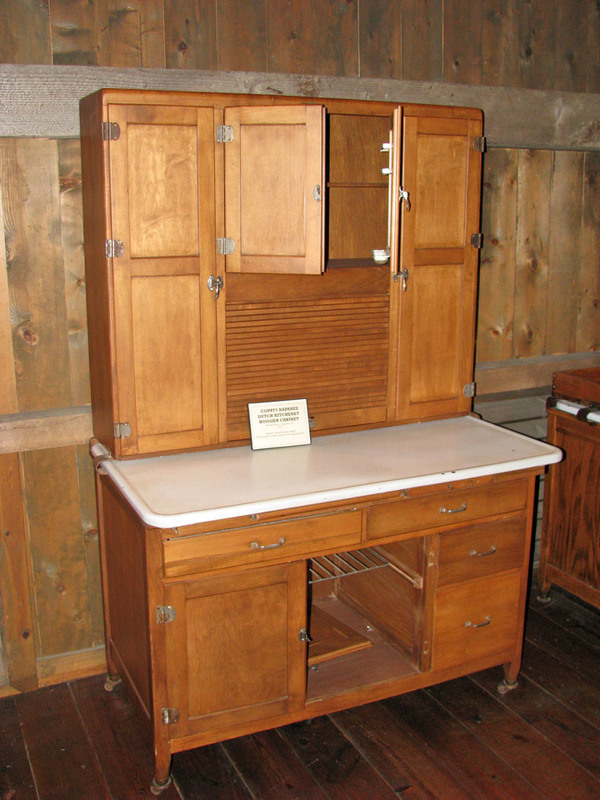 The farm was purchased in October 1968 at auction from the Manasses Kuhns’ estate. The farm was homesteaded by Moses Stahly in 1873. Moses was the son of pioneer Christian Stahly who emigrated from Germany with his widowed mother Barbara and three brothers to the southwest corner of Elkhart County in 1839; making them, perhaps, the earliest Amish settlers in Indiana. 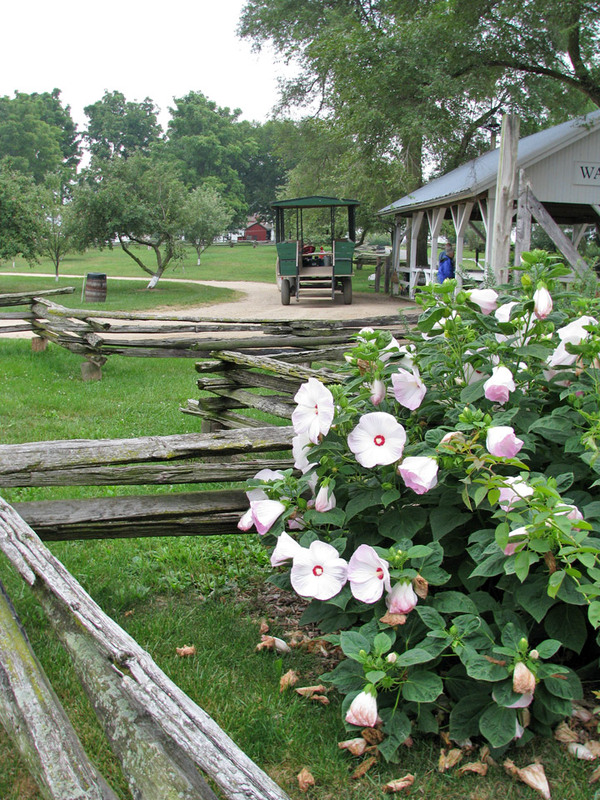 Amish Acres opened to the public in June 1970 after more than a year of restoration. Today the complex includes the original nine buildings, two relocated log buildings, ice house, mint distillery, maple sugar camp, apple cider mill, one room school, blacksmith shop. 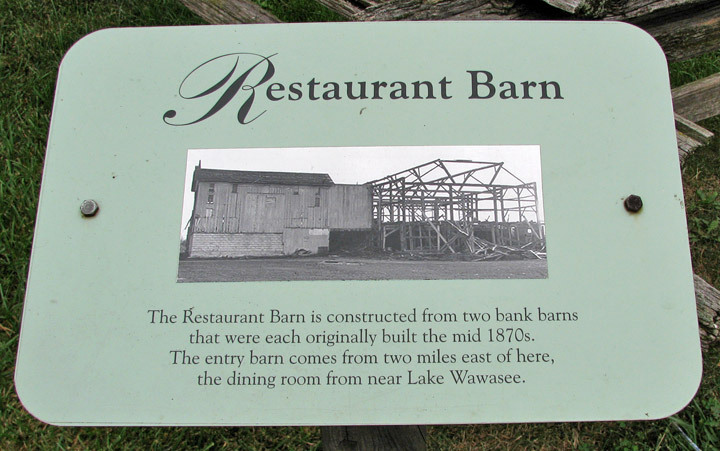 Three bank barns and The Round Barn Theatre have also been moved to the property. 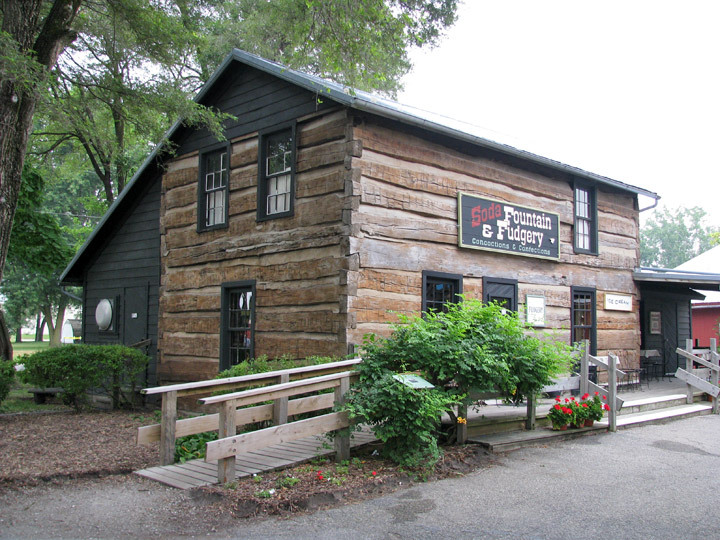 The original farmstead is listed in the National Register of Historic Places. According to James Landing, University of Chicago, a separate Amish settlement on the eastern side of the county began holding church services in 1841. The land granted to the Stahly brothers was nearly contiguous farms. Because of the tamarack swamp to the south of the continental divide and the heavily forested land to the north, it was the last part of the county settled by immigrants. 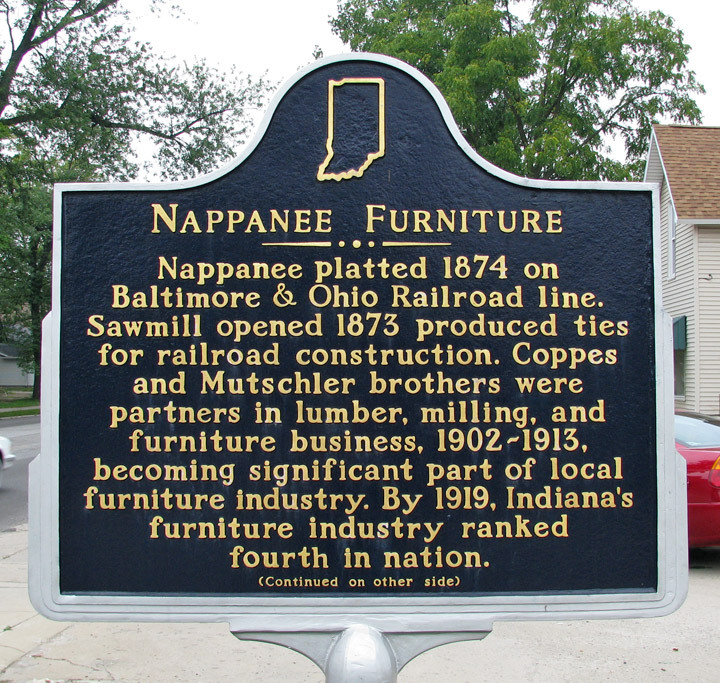 The county was created in 1830 in Indiana out of the Indiana Territory following the creation of the State of Ohio. Colonel John Jackson was sent into the area to eradicate the Pottowammi Indians living in a village on the Elkhart River near present day Baintertown. U.S. Government forces destroyed the abandoned village twice in the decade. Chief Five Medals had made two trips to Washington, D.C. to acquire federal grant money to help transition his village from hunter-gathers into farmers, so as to live peacefully beside the arriving white settlers. The last of the Pottowamis were removed from Indiana by decree of the Indiana Removal Act signed by President Andrew Jackson in 1830. According to Levi Ulery's diary, in 1873 the Baltimore, Ohio & Chicago Railroad surveyed a route from Sandusky, Ohio to Chicago. 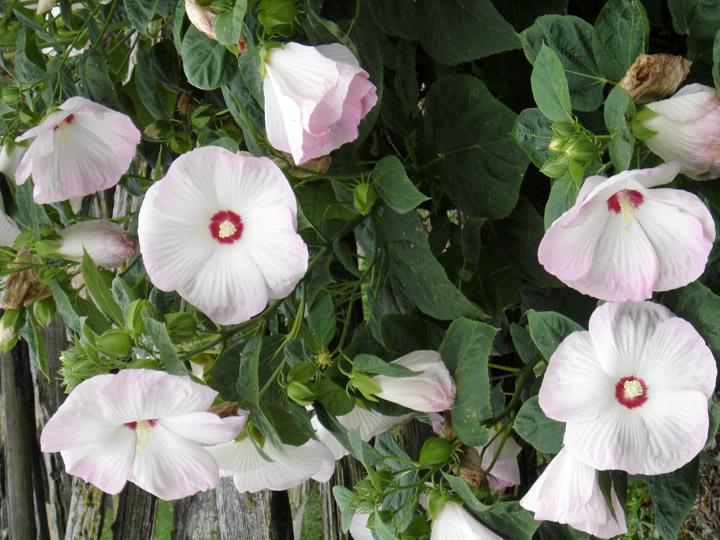 In spite of intense lobbying from Goshen, Indiana, the county seat, the railroad chose a bee line route through the swamp and hardwoods hugging the north-south continental divide. The swamp was the headwaters of the Kankakee River basin, one of the largest fresh-water swamps left in the country at that time. Government drainage programs financed ditches and clay field tile that created some of the most fertile farmland in the Midwest. 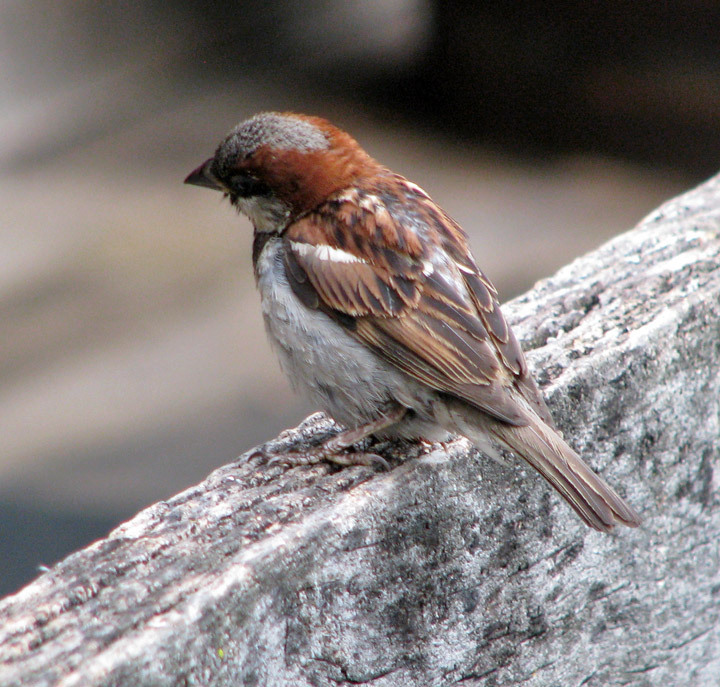 The timber to the north provided the natural resources for a sawmill industry that by 1885 had 20,000 logs in its yard. 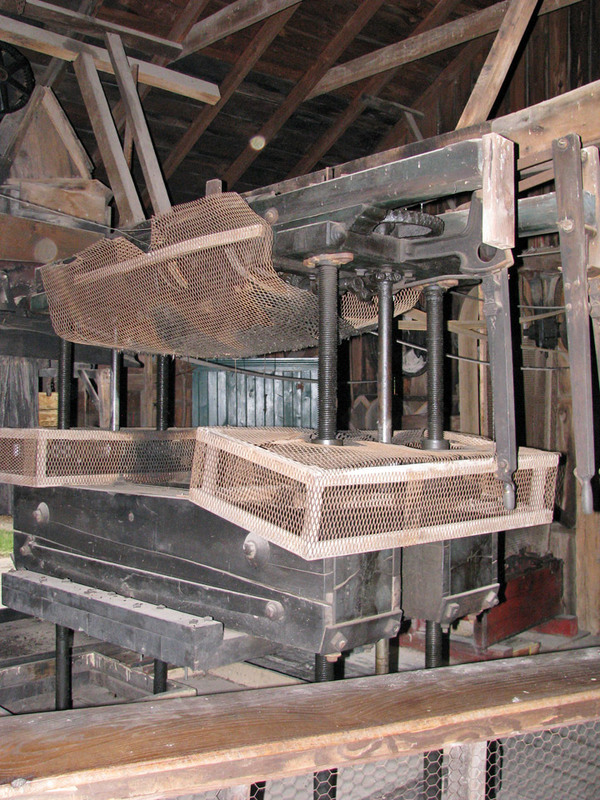 A planning mill began building wooden boxes that were shipped to Elkhart, Indiana to package Dr. Miles Nervine. In 1893 the Moses Stahly family moved to Reno County, Kansas, a result of the Windmill Controversy. It revolved around the introduction of windmills to pump water and manure spreaders and other mechanized horse drawn farming implements. 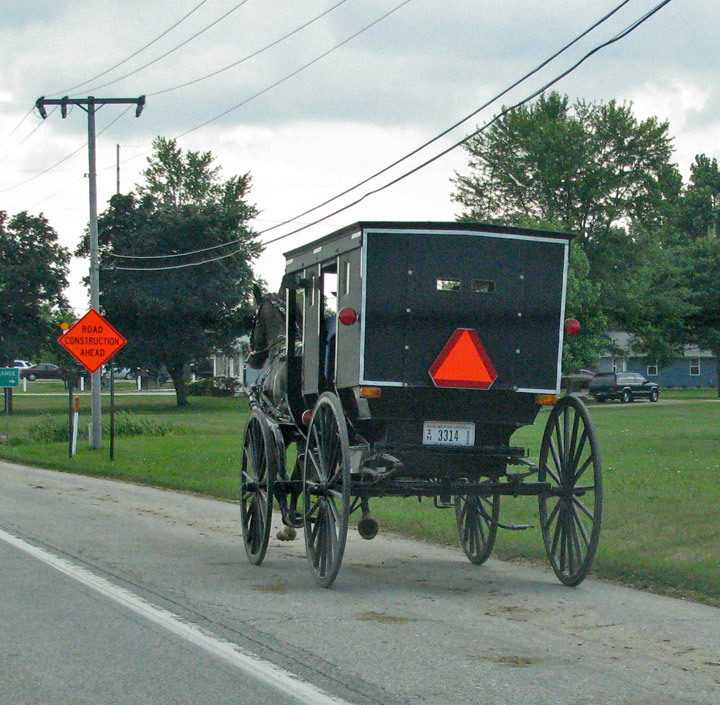 The more conservative Amish removed themselves from the area rather than adopt the modern machines. 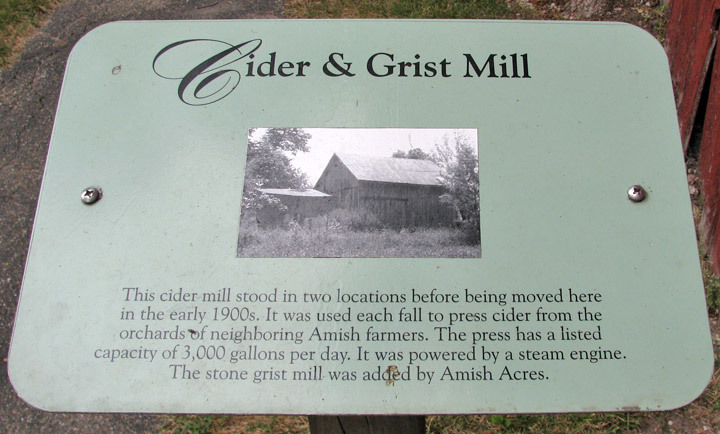 The Stahly farm was purchased by Noah Nissley, Stahly’s father-in-law. The Nissley family came from Ohio where their house had recently burned. 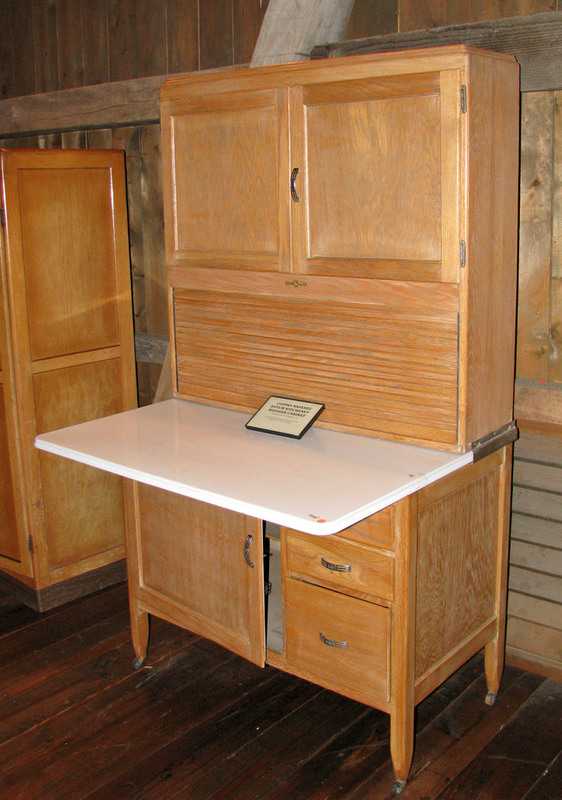 They built a near replica of their Ohio house on the farm, connecting it to the original two-room clap board house. The Nissleys moved into the gross daadi house upon retirement from active farming and son-in-law Manasses Kuhns took over the operation. 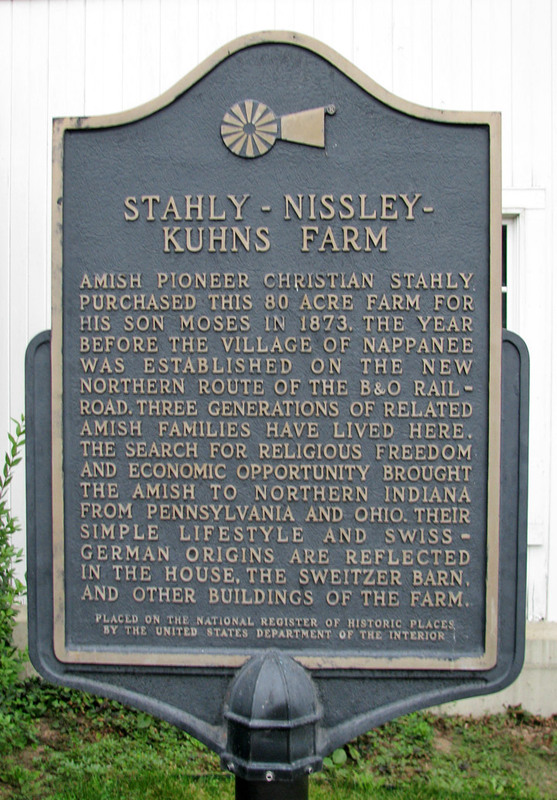 The Stahly-Nissley-Kuhns farm is now listed in The National Register of Historic Places. Through years of neglect due to Kuhn’s debilitating illnesses, the farm fell into disrepair by the time of his death. 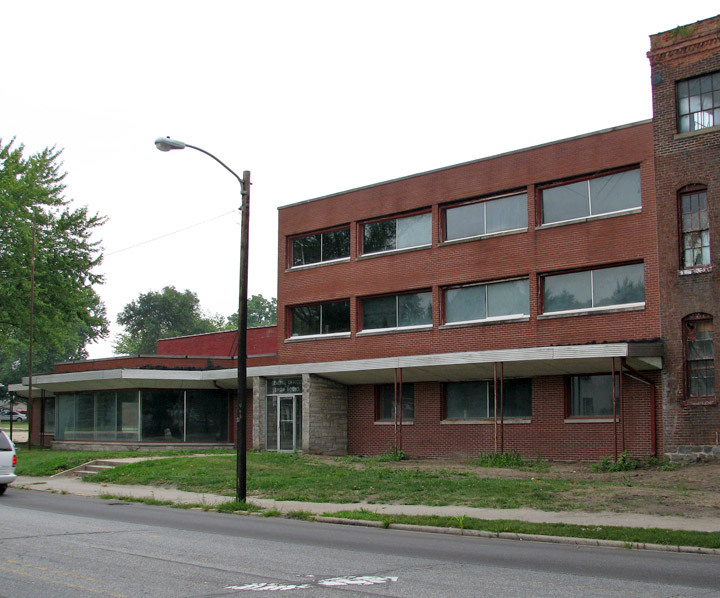 Because of this neglect numerous original buildings long past their usefulness were spared destruction. These outbuildings include a food drying house, outdoor brick bake oven, smoke house, root cellar, and apple cider mill. The orchard had been abandoned but left intact. 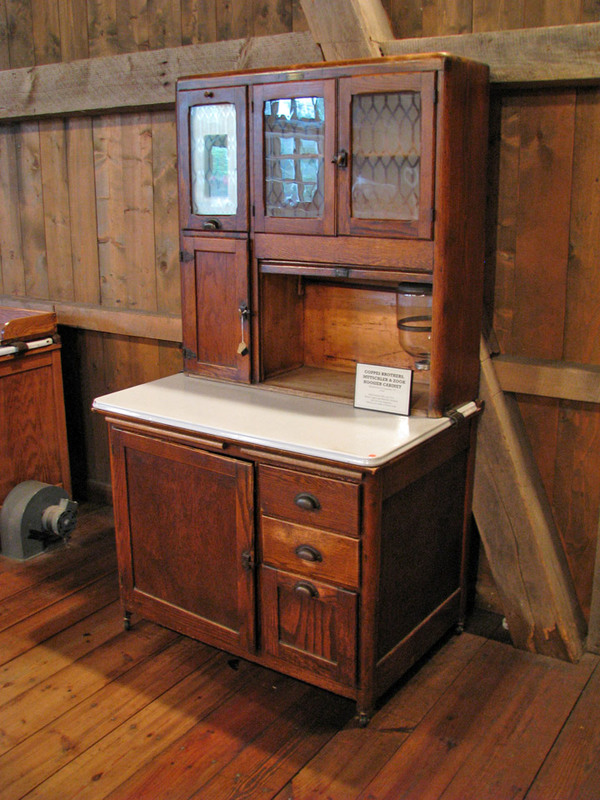 The concept of purchasing the farm and creating Amish Acres for the purpose of preserving and restoring the buildings and opening it to the public for guided tours with historical and cultural interpretation came from LaVern and Richard Pletcher, furniture merchants since 1933. 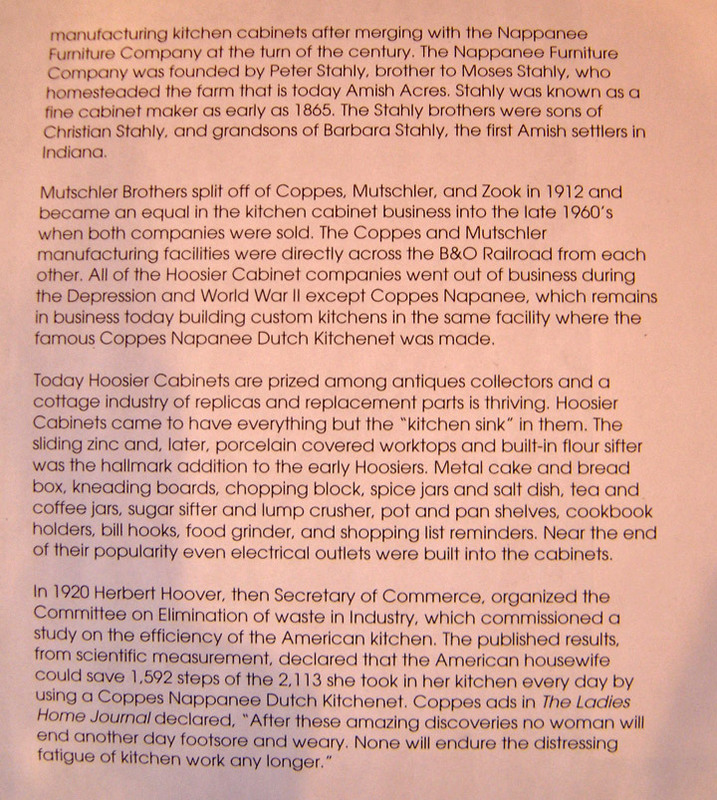 The secondary purpose was to introduce and formalize Amish tourism in the Indiana city. Restoration was completed by 1970 with the assistance of Fred Simic and Albert Kuhns, son of Manassas. Albert’s vivid memory helped bring long dormant buildings and mechanisms back into working order. The farm opened to the public on the second weekend in June, 1970. A master plan was drawn by architect Robert Holdeman of Traverse City, Michigan. Holdeman grew up in Elkhart County whose roots remain in the Holdeman Mennonite Church near Wakarusa, Indiana. The plan has been executed closely over the decades and now includes the dining, lodging, and theatre programs originally envisioned. The Pletchers incorporated Amish Acres following the successful bid with investors Freemon Borkholder, Ivo Heckaman, and Gordon McCormick. 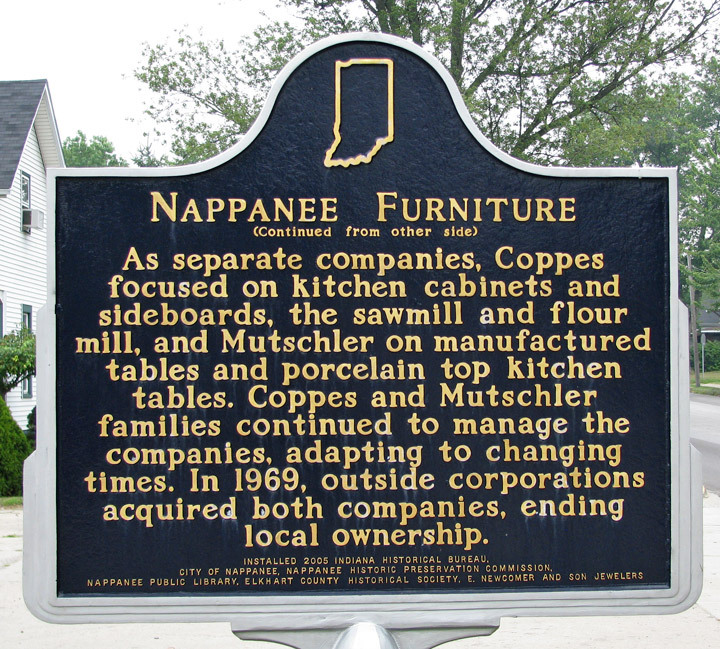 These investors were successful business entrepreneurs in Nappanee. 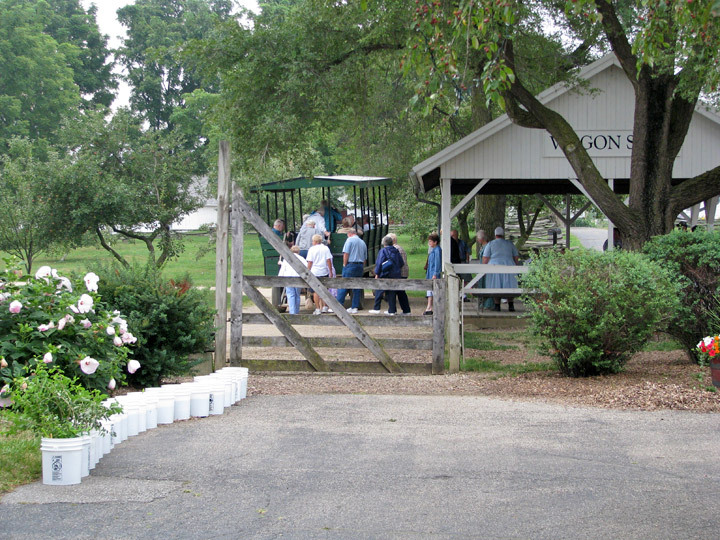 Shortly after the opening of the farm a dispute about Sunday opening led Mr. Borkholder, an Amish-Mennonite to sell his interest in the project. 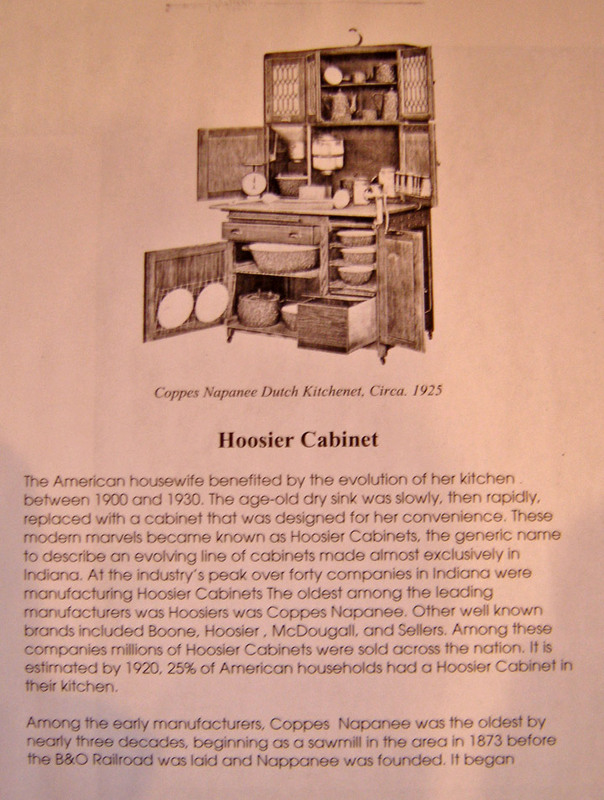 Heckaman and McCormick were soon bought out and the Pletchers have continued to develop the attraction. Richard’s daughter, Jennifer Wysong, is now president of the company. 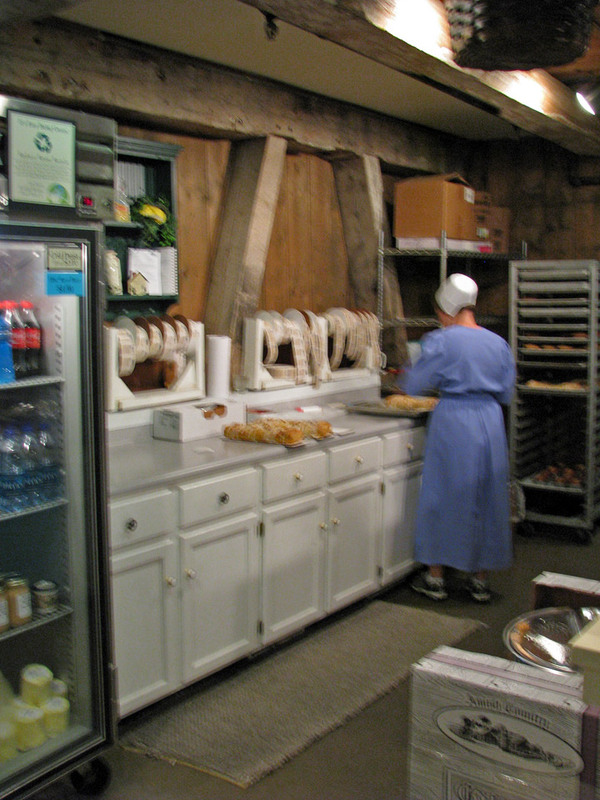 Over half of Amish Acres visitors come from outside of Indiana although many local constituencies are served by the restaurant, musical theatre, and arts and crafts festival. 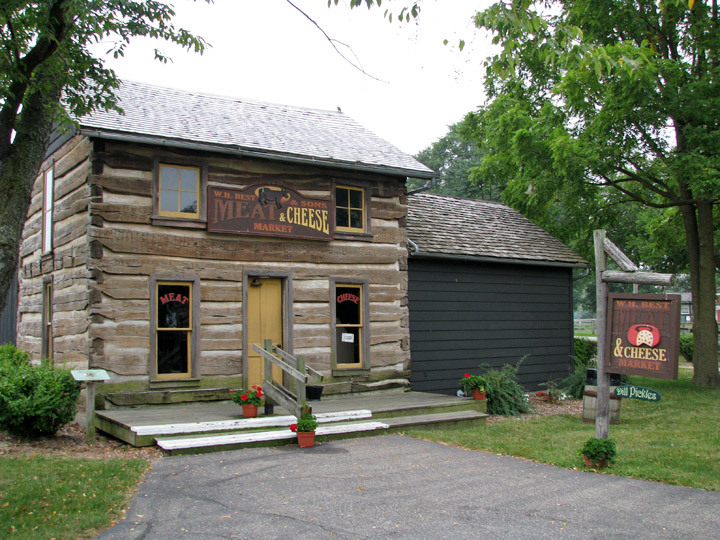 Amish Acres has been recognized by Time, Newsweek, and US News and World Report magazines for its contributions to reviving Nappanee’s economy, early Internet retail selling, and the arts and crafts festival. 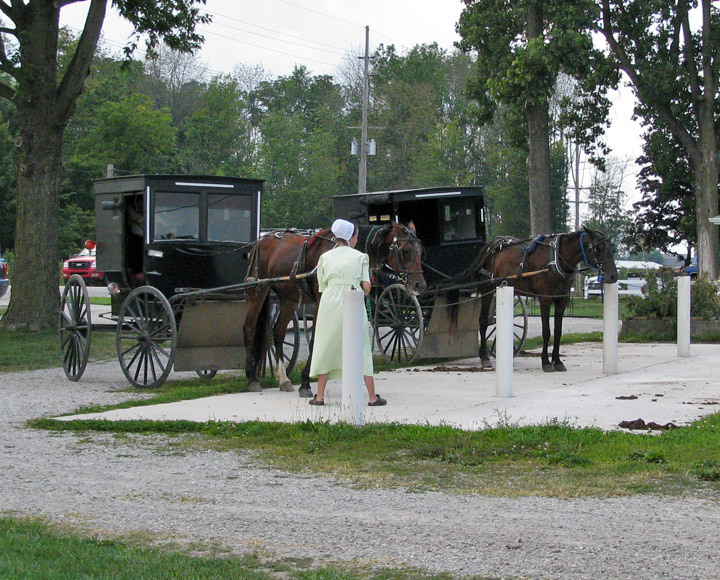 Travel Trade magazine has named Amish Acres Indiana’s number one tourist attraction, Mobil Travel Guide has listed Amish Acres as a must see Midwest attraction, the only private entity on the list. 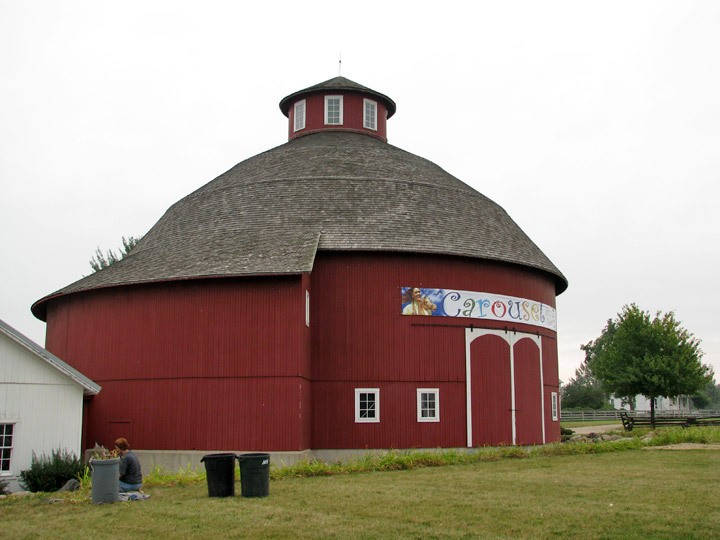 The Round Barn Theatre is the national home of Plain and Fancy, a 1955 Broadway musical about Amish life and love. It was the first musical for co-author Joseph Stein and composer Albert Hague. Each went on to win Tony awards for, respectively, Fiddler on the Roof and Redhead. Amish Acres production of the musical comedy has been running for 21 years in 2007. 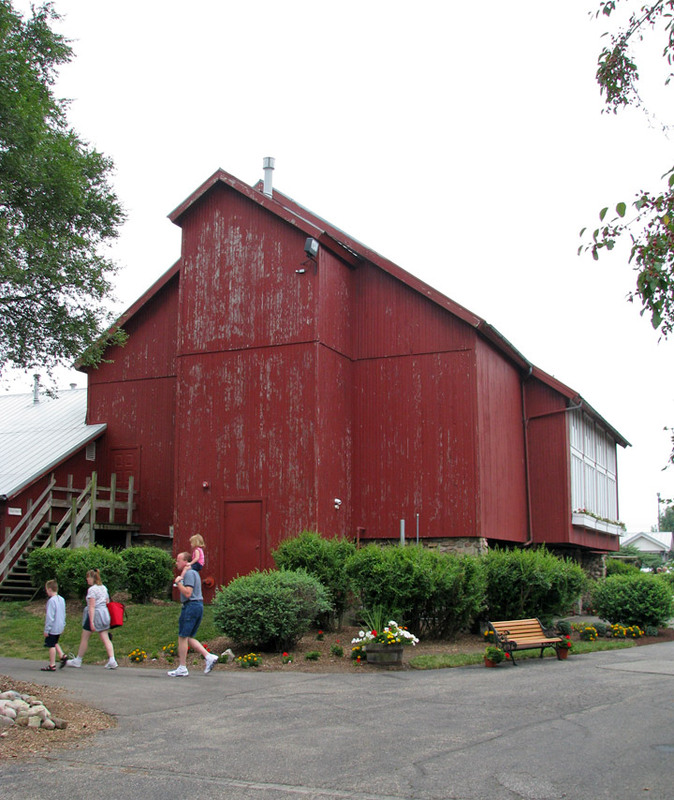 What started out with of a cast of four and an upright piano in the Locke Township Meeting House, a replica building designed as a movie theatre, it has evolved into a classic production with a cast of nine on the proscenium stage of The Round Barn Theatre. The building was dismantled, reconstructed and converted to a state of the art theatre seating 400 in 1992. In 1995 repertory theatre was added to Plain and Fancy in rotating performances in the same stage. The company is created from annual auditions held in New York City. Company and cast members are housed in three houses on Amish Acres campus. 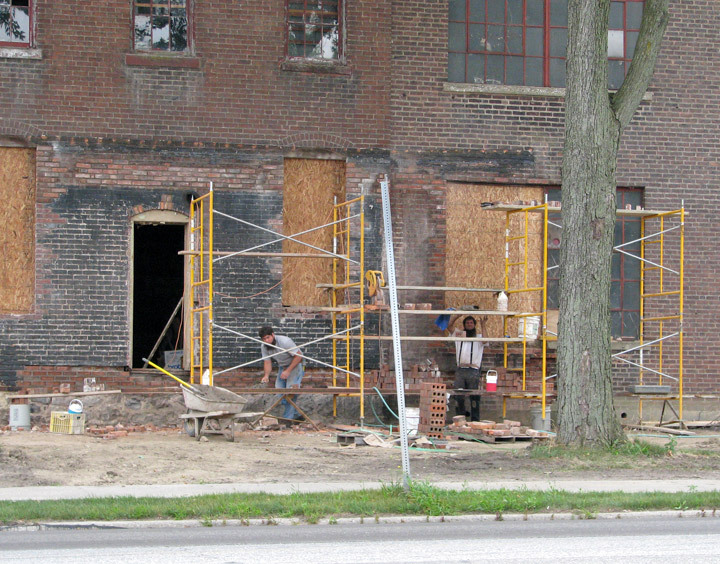 A scenic shop, costume shop and rehearsal studio completed in 2006 have made way for The Joseph Stein Young Actors Studio, a series of classes and camps for 8-12 year olds and full productions using high school students. This Wooden O, by Frank Ramirez with Richard Pletcher was published in 2001 as a commemorative edition in celebration of the United States Postal Service dedication of the Amish Quilt commemorative stamps, the first of the American Heritage Series, with the first day issue from the Nappanee Post Office. 95 million of the stamps were printed. 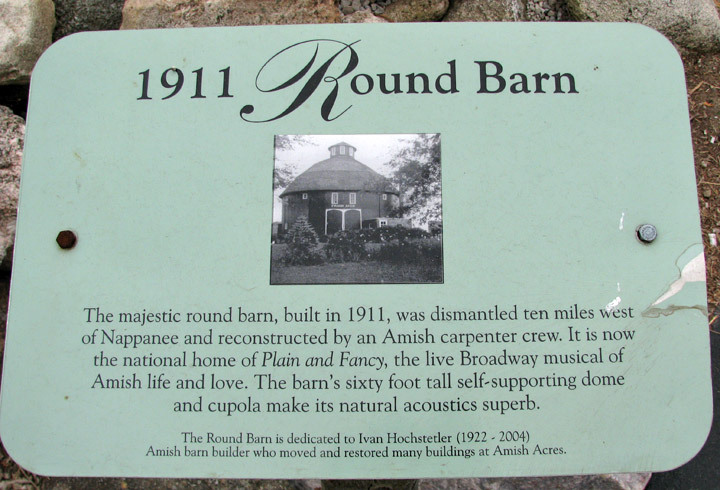 The dedication ceremony was held in the Round Barn with a cast of Plain and Fancy alumni singing “Plain We Live,” the anthem from Plain and Fancy. In-house artist Jeff Stillson was commissioned by the postal service to design the cancellation.